Pro Tip: we use the StringEscapeUtils from org.apache.commons.lang. This is already available on your weblogic server (albeit an older 2.1.0 version). All you have to do is to add the "WebLogic 10.3 Remote-Client" library to your project to extend your compile time classpath. Runtime is already taken care of since it is on your weblogic server. As always you can download the full sample application or browse the subversion repository to look at the source code. The subversion project started as a copy of the previous sample without parameters, so look at the revision history to so the details of what was changed to support attributes. And even though it is not the most fancy application you can also see it live on Oracle Cloud. If there is support for this, could you point me to the class I should be using here? My "end goal" is to create a declarative component that sets the focus on a client component as you made reference to your previous post on this subject. As far as I know, only the af:document supports the onLoad event. If all you want to do is set the focus to an item you can look at the initialFocusId attribute on af:document. 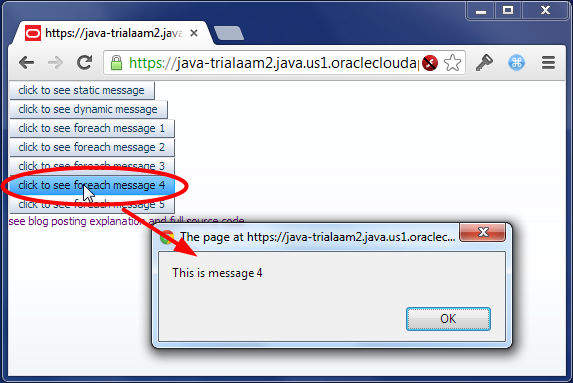 However, a typical ADF application uses region with page fragments and you won't have the af:document in a fragment.